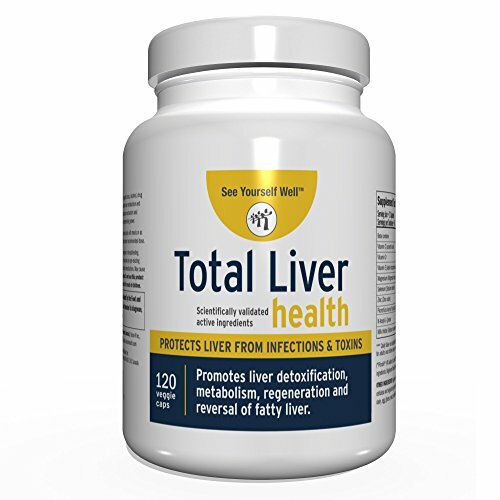 Total Liver Health: Liver Cleanse, Detox, Regeneration, Fatty Liver Reversal. Protection from Infections & Toxins. Trademarked Ingredient Picroliv. A safe & effective nutraceutical for liver disorders caused by chemotoxins, drugs, alcohol, virus and food. The liver plays an important role in digestion and storage of essential vitamins and helps to metabolizes fats, carbohydrates and protein. The liver also acts as a cleansing organ of the body and helps in the detoxification of harmful substances from the body. Disorders can weaken the liver, as can overconsumption of alcohol or certain medications and exposure to pesticides, food toxins and other forms of air pollution. With age, the liver decreases in size and toxins are not removed as efficiently. It is important to protect and detoxify the liver, which can be done through the proper use and combination of herbs, various vitamins and antioxidants. Protects liver from viral infections and toxicity induced by drugs, chemicals, alcohol and food. Promotes liver regeneration. Promotes liver detoxification. Promotes reversal of fatty liver. Promotes metabolism of carbohydrate, fat and amino acids. Strong antioxidant. Heart health (may help in the reduction of triglyceride and LDL cholesterol levels in the blood). Click "Add to Cart" now so you can live a healthier version of the life you want! If you have any questions about this product by See Yourself Well, contact us by completing and submitting the form below. If you are looking for a specif part number, please include it with your message.